Take on the part of a would-be hero, starting up from local neighbourhood watch wannabe you will quickly rise in notoriety and status and escape your little sleepy suburbia as you venture out into the big city. Filled with adventure, quests and all manner of bad guys and arch villains you will quickly find your place among the people as a true hero. From rescuing cats and helping people cross the road your hero will be thrust into a world of real criminals. The game itself is very mission-based, dividing them into two types: time missions and combat missions, gaining EXP that you can use to boost your various skills as well as coins that can be used to improve your gear, purchase can consumables items and spend on customising the look of your hero. Many of the features within the game are time based and so using coins players can increase the speed at which these activities are completed so that they can move on with the game. For extra cash, and a wafer your hero to keep their alter ego hidden, players can take on a day job and was then manage their time between doing their job and fighting crime; a hero can’t be out helping the innocent at the same time as holding down their day job. 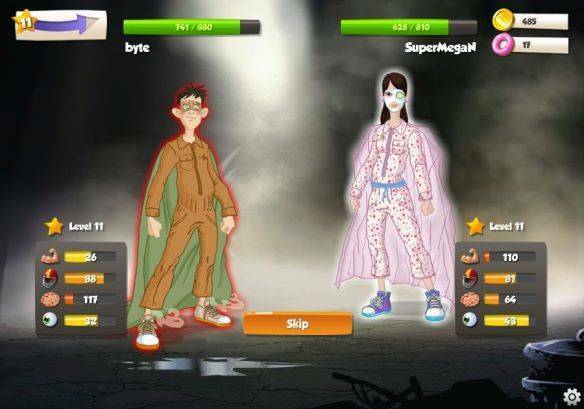 Your hero is fully customisable with the app role that they can wear, a number of quirky and fun cosmetic items are available from the in game store and can also be earned through playing the game and completing various missions. This humorous element is most prevalent in the types of items you can buy, everything from flowery shirts, pink dressing gowns, wigs, masks and weaponry such as blow dryers. Combined with the character creation features it is easy to carve out a unique look for your hero. The game itself has a wonderful stylised comic book look set to impressive illustrated backgrounds and lovingly drawn characters that you will meet in your adventures. The quirky sound effects combined with the graphics style and overall humorous tone of the game makes it ideal for players of all ages and is extremely child friendly with its silliness and colourful graphics.